Chicory Root Coffee Canada - Free Shipping Over $35! Chicory Coffee uses Chicory instead of (or in addition to) coffee beans to create a strong flavour brew with no caffeine in itself. When coffee is added, the caffeine in the coffee beans may be present unless specific decaffeinated. The root of the Chicory plant is harvested, dried and ground into a brewed beverage similar to coffee. It is harvested in a similar fashion to sugar beets, being pulled from the ground mechanically before processing. 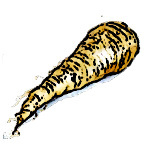 It is high in inulin, which caramelizes during the roasting process to change into fruit sugar and gives it the characteristic colour and sweet flavour with low bitterness. Chicory root coffee is popular among people looking for a "low acid" coffee and is particularly popular around New Orleans. It is sometimes referred to as "Orleans Coffee" or simply "Cafe au Lait" in New Orleans. Chicory grounds are made of around 50% soluble particles (compared to 25% in coffee) which means that only half of the weight of ground chickory is needed compared with regular coffee beans, while still providing all the benefits. It can be consumed by itself (100% Chicory Coffee) or in combination with regular coffee (Chicory Plus Coffee Beans). Pure brewed chicory is essentially "Chicory Root Extract". Pure chicory coffee contains low acid compared to coffee beans, making it suitable for those who need to adjust their diet. With a texture and mouthfeel that is similar to coffee and a roasted, nutty flavour that is slightly different, it's a great caffeine-free alternative to coffee. When chicory is mixed with ground coffee beans, it will have some caffeine while still retaining all the benefits of brewed chicory. While the majority of chicory root fibers are filtered out, the important micronutrients and beneficial compounds are still absorbed into the brew itself. Decaffeinated coffee can be added to chicory to ensure a drink with minimal caffeine. Decaffeination removes 95% - 99% of the caffeine that is present in coffee, leaving anywhere from 1mg - 5mg of caffeine. The decaf process can be any one of the regular process, CO2 process or Swiss Water process. Regular decaf process is a quick an inexpensive method of decaffeinating coffee, and is the most prevalent. CO2 decaf process uses carbon dioxide (a naturally occuring chemical that isn't harmful) to remove the caffeine from coffee beans. Swiss water process uses pure, fresh water to slowly remove caffeine and leaves no chemicals, but is more expensive and difficult to find. Copyright © 2019 ChicoryCoffee.ca. Chicory may be misspelled as Chickory.